Popular Holdings is a common enough household name in Singapore and in this post, I will bring you through my thought process when I examine a business. I have attached the operations and financial review from their latest annual report, and for the sake of brevity, I will only be providing some financial ratios. My own view is that you should never look at the price of a business before deciding whether to invest in it. The price action (or market capitalization) reveals very little about a business, and that should be your last port of call. Price is what you pay, value is what you get. It is therefore important to establish what a business is worth before deciding whether to invest in it or not. Balance sheet strength is what I look for instinctively, and I always examine how leveraged a business is. Although leverage can help boost profits, it can be a different situation in times of financial stress. In this case, Popular Holdings is conservatively financed with a debt to equity ratio of 0.10. Next, I look at how much equity the business has. Two businesses earning the same amount of money each year are worth a different value if they have differing amounts of equity. In this case, my focus is on liquid current assets. This is a quick back of the envelope test that I use when I first look at a business, and before I decide whether it warrants a second look. I normally adjust the values, placing more emphasis on cash and equivalent assets, and impairing assets such as inventories. Next, I do not include non-current assets to err on the conservative side in my calculations. I will include a more in-depth discussion on this in the future. So now that we have established the business is sound, I turn to look at the profitability of Popular Holdings. 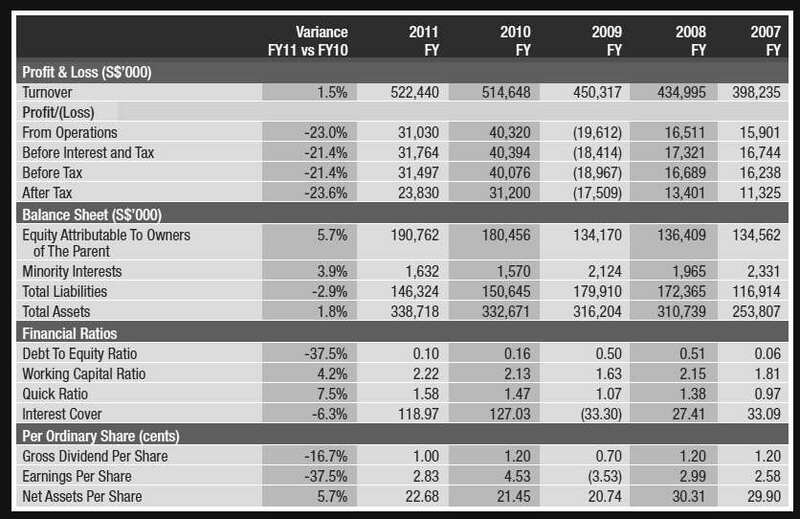 If you look at the review of the financial results, you will notice that results for FY 2009 – 2011 were erratic. A little bit of digging reveals that this was due to a non cash impairment of $28.2 million taken in FY 2009, and its subsequent reversal in 2010 ($21.7 million) and 2011 ($6.5 million). Excluding the effects of the non cash impairments would result in about a net profit of about $10.7 million in FY 2009, $9.5 million in FY 2010, and $17.3 million in FY 2011. Based on the latest closing price of 3rd August 2012, Popular Holdings has a market capitalization of $197.6 million. Bearing in mind that the figures I used were from the annual report from FY 2011, and not the latest financial results from FY 2012, whereby it reported a net profit of $31.1 million. So currently, we have a business that’s trading at a trailing P/E of ~6.4, and that has liquid assets of about $143.9 million (based on audited financial results from FY 11). You are essentially obtaining a business for ($197.6 million – $143.9 million) for $53.7 million, and that has generated an average of about $19.3 million in net profit in the past 3 years. How do I decide whether it makes sense to invest in a business? Once I have done the necessary research to ensure that I am comfortable investing a company, it really comes down to the price that I am willing to pay. In this case, I want to invest in a business that has an earnings yield (inverted Price/Earnings Ratio) that is at least double that of the triple AAA corporate bond rate (~ 5%). In other words, I want an earnings yield of at least 10%. In this case Popular fulfils my criteria. If it pays out roughly half its earnings in dividends, giving me an equivalent dividend yield of about 5%, Popular Holdings will only need to appreciate about 5% annually to give me a return of 10% a year. The value of its liquid assets provides an additional draw, making the business much more attractive to own considering that you are paying very little for what essentially is a very profitable business. This is a very brief summary of my thought process when I look at businesses. Other factors which I look at (but were not discussed) include Free Cash Flow, whether the business is capital intensive and so on. The purpose of this post is to provide you an idea of how I go about researching businesses. Is it logical that you are excluding working capital A.K.A liquid assets? In other words, if you bought Popular at $53.7m, you still need to fork out another $143.9m in order for the business to maintain its daily operations. The point of including this value in is to differentiate between two companies with identical earnings. Company X is more valuable than Company Y if it had more equity, especially if it takes the form of cash equivalents. It would not make sense If both businesses carry the same valuation. As a quick back of the envelope test, assigning a value to these assets is logical. If one decides that that a business is worth a second look at, than it deserves a closer look at to determine an approximation of what these assets are worth in our valuation. What your analysis falls on is based on the net cash approach. In other words, if I buy a box with a $5 bill in it for $7, I am essentially paying just $2 for the box. Put it back to Popular’s case, is the cash really net cash? Has the net cash just appeared in the balance sheet or has it been there for a long period of time? In that case, why isn’t the mgmt paying the net cash back to shareholders? I think the point of contention here is what value do we assign to the equity of Popular Holdings. As I mentioned before, this is a quick back of the envelope test to help filter out possible investment opportunities. Secondly, it does not make sense to me that we are paying $197.6 million for Popular Holdings when the business is not in a net debt position. Assuming we were to take over the business today, the liquidation value of the business would be assuredly be in excess of $0 million. It does not make sense that two similar business will carry the same valuation (assuming they earn the approximately similar earnings) when they have differing values of equity. As mentioned earlier, the real question is what value do we assign to its net assets in our valuation – which would than bring us to the next step of determining the excess cash that the business holds. Finally, Popular Holdings has been returning to shareholders its net cash in the form of dividend payouts, and a future share buy back will be tabled in the upcoming EGM. As to the other 2 questions regarding its net cash position, that information can be gleamed upon examination of its financial statements in the preceding years. I respectfully disagree with both of your comments, but the issue is probably just semantics. 1. Juno has valued the equity at S$143.9m (based on NCAV – which is subjective, but not wrong, as with all valuation 🙂 ). 3. I disagree with dzwm’s comment that Juno’s calculation is the net cash approach – this is not a net cash approach (again probably just semantics). Assuming Juno’s equity valuation of S$144m, Popular’s EV is S$144 + ~S$20 (debt) – excess cash ~S$52 (assuming fixed deposits is operating cash) = ~S$112. If we purchase the whole business without raising debt at current market price, then we are paying S$190m for the whole business with EV of S$112m (net cash+equity), afterwhich the acquiror could retire the debt and distribute the excess cash, which works out to be the same equity value of S$144m. (this calculation btw is nevertheless flawed – as the NCAV valuation has included all cash, but I have used it for illustration). 4. Lastly, i disagree with Juno that you can estimate excess cash after you have determined the intrinsic valuation of the business. Excess cash is not an operating asset, and by definition, does not contribute to your operating value of the business. In fact, we should value excess cash, and adjust it from the business value to arrive at intrinsic value. Here I prefer Buffett’s lens on the use of cash i) Primarily for capex/re-investment, failing which to achieve a suitable return on capital above cost of capital, to ii) return to shareholders via asset conversions/share capital reductions or straight dividend payments. Based on this lens, excess cash would be estimated as whatever that is in excess of i). – for simplicity I have assumed excess cash as S$52m in part 3. In anycase, Popular Holdings has a strong financial position as pointed out, and a reasonable valuation (definitely not distressed / deep-value cheap). But the larger issue in my mind is – whether there are any catalysts in sight to realize/unlock some of the hidden value.